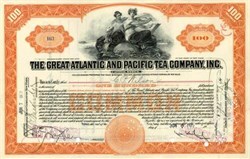 Beautifully engraved SCARCE certificate from the Great Atlantic and Pacific Tea Company, Inc. prior to 1925. 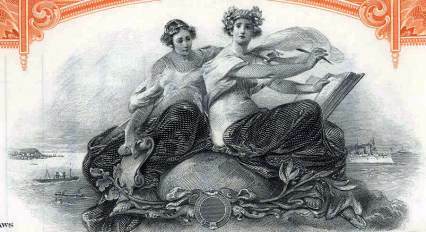 This historic document was printed by the American Banknote Company and has an ornate border around it with a vignette of two allegorical women sitting on a globe. This item is hand signed by the Company�s President ( George Ludlum Hartford ) and Treasurer and is over 77 years old. Early A & P certificates signed by Hartford are very scarce. Established 1859 as the Great American Tea Company. Added grocery items to stores late in the 19th century. Opened 10,000th store in 1923, using the Economy Store format seen across America since 1913. Number of stores peaked in 1930 with 15,737 (annual sales of $1.07 billion). Conversion to supermarkets reduced store count to 4150 by 1955. George L. Hartford (1864-1957) was the President of the Great Atlantic and Pacific Tea Company.